Rep. Ilhan Omar (D-Minn.) sparked backlash Sunday evening from members of both parties — including former first daughter Chelsea Clinton — after she accused a prominent lobbying group of paying members of Congress to support Israel. Yet Sen. Chuck Schumer, the man who attends one Jewish event after the next and brags about being the “(Schumer) Shomer Yisroel” [SEE VIDEO BELOW], remained totally silent for a really long time. Not only is he the highest ranking Democrat in the country, but he a JEWISH Democrat from our community. Schumer issued his half-baked statement only after Nancy Pelosi and many other Democrats issued a condemnation. 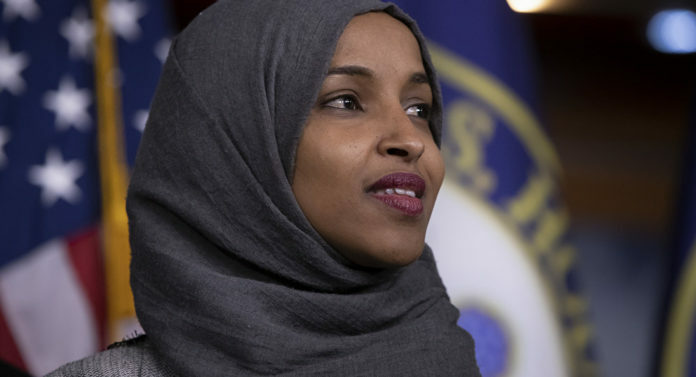 Omar, a Somali-American who became one of the first Muslim women elected to Congress in November, responded to a Twitter post by journalist Glenn Greenwald criticizing House Minority Leader Kevin McCarthy (R-California) for threatening to take action against Omar and another freshman Muslim lawmaker, Rashida Tlaib, D-Mich., over allegedly anti-Semitic remarks. Greenwald accused McCarthy of targeting Omar and Tlaib for their numerous criticisms of Israel, to which Omar chimed in “It’s all about the Benjamins, baby,” quoting a 1997 rap song by Puff Daddy, and invoking slang about $100 bills. She then doubled down when challenged by Batya Ungar-Sargon, the opinion editor of The Forward newspaper. In response, Omar tweeted “AIPAC!” referring to the American Israel Public Affairs Committee, which advocates for the close relationship between the US and Israeli governments. The tweets touch on a long-running anti-Semitic stereotype that “rich Jews” control politics, and that is the basis for politician’s support of Israel. House GOP conference chair Liz Cheney, R-Wyo., slammed Omar’s remarks and called for House Democrat leaders to remove Omar from the Housed Foreign Affairs Committee. Good faith and respectful debate over American-Israel policy (or any other policy) in the Halls of Congress is appropriate. Impugning the motives of US officials who support Israel with false allegations of payoffs is disgusting. This is an existential moment for the Dems….if they don’t come out strongly against this kind of antisemitism and make it clear there is no room in the Democratic party for these left-wing loonies, than they will once again have ceded the high ground to the Trumpkopf. Its not even a close call and these assertions of ‘first amendment rights” are a joke. We can disagree on marginal tax rates for billionaires but NOT on these kind of fundamental issues. Representatives like this should be dealt with like Steve King, remove them from all committees. Why is calling out israel for its human rights violations racist? you continuously right this as if Israel is above any reproach. rt – Good luck with that. Dems = “Rules for thee, but not for me”. Talmid1…..I’m not a big fan of Bibi or EY’s settlement policy, but these Dems have decided to make Israel bashing a test of how far left they can push the Democratic party. They’ve never offered any constructive dialogue on settlement policy nor do they openly criticize Palestinian terrorism but always are quick to condemn Israeli responses. No orthodox leader will criticize Schumer so long as he brings in the bacon to the mosdos. Leaders dont care about anti semitism until it hits their pocket. Gadolhadorah, wants Democrats to denounce this radical Muslim Somali only because it gives Trump “high ground” and makes her fellow leftists look bad. So typical of liberals. Ilhan Omar should be deported back to Somalia, where she and most of Somali “refugees” in US belong. Pelosi, who appointed Omar to the powerful House Foreign Affairs Committee last month, should also be condemned. @Talmid1 “Israel is above any reproach. Why?” she didn’t mention Israel. She said AIPAC. Sorry Talmid1, but calling Israel an apartheid state is such blatant antisemitism because it is so obviously not, that the only motivation that could cause such an inaccurate accusation is antisemitic sentiments. Gadolhadorah, your demagogic rant will not do you a favor, once your hypocrisy being exposed. She could care less what we think or say she has a mission and she is going after that mission. The way to change this decree is through prayer and more prayer that she goes away or loses the ability to speak, etc. Moisheingolus, you cannot complain about anti-semitism at the same time that you publicize your racist views. If it is wrong against the Jews than it is wrong against everyone. TalmidCochom’s post about why nobody will criticize Schumer is the same hypocrisy. If Omar would have said it , it would be ant-semitism. Dov Hikind’s criticism of her has no weight since he has already compared her to Goebbels . jackk, educate yourself before virtue signaling. lhan Omar and most Somalis are bogus “refugees” who came to this country only to collect welfare and spread their Jihad ideology. If they were genuine refugees they would not fly back to Mogadishu next day after getting US passports. And genuine refugees usually escape from the countries practicing oppressive ideologies, not bringing and spreading these ideologies here. lhan Omar is a typical fraud who fraudulently married her own brother in order to get him US visa and in the past petitioned Courts for leniency for convicted ISIS Somali terrorists from Minnesota. Since you are so educated, please enlighten all of us with the source of your fountain of wisdom ? I will not accept anything from fox news. MIG- Somalia has been in civil war for years, yes they can be considered refugees. And at the same time we don’t have to accept anti-Semitism. jackk, i am not going to waste my time providing lazy people with sources that are readily available on the web for everyone to see. Why should i trigger snowflakes like you with facts? Continue your self-censoring by getting doze of reliable Fake news from CNN, MSNBC WAPO, NYT and the rest of them. jackk, you are probably one of these individuals that still believes that Benghazi happened due to of YouTube Video. Whys? Because CNN, Hillary and Obama claimed so. right? Somalia has an ongoing civil war started in 1991.In 1990–92 customary law temporarily collapsed due to the fighting. This precipitated the arrival of UNOSOM – UN military observers in July 1992, followed by larger peacekeeping forces. In the absence of a central government, Somalia became a “failed state”.The UN withdrew in 1995, having incurred significant casualties, but no central authority had yet been reestablished. Now , go find out when her family became refugees and when they were allowed to come to America. it is a sad day for Jews when so many of the commentator on this website exhibit racism, xenophobia and ignore their own past. Where did your parents and grandparents come from? How can you all be anti-immigrants and exhibit such hatred and disdain for people who followed the same path that your parents did. we-the Jewish people have suffered most from the anti-immigrant drivel that dominates thi blog. Millions of Jews might have been saved if the US would have more sympathy for our parents and grandparents. And you want to deny this to other oppressed people! Shame on you all. rabbiofberlin, we do not need type of “Immigrant” likes of “Ilhan Omar” here in this country. We do not want to turn our cities into Sharia no-go zone like in so many European cities including Berlin. jackk, you are making progress, continue reading. I am looking forward for your next report on Somali “refugees”. 1. I’m Jewish just to put that out there after it was questioned above, I try to keep all taryag mitzvos too if ur curious not that any of that has any bearing on the conversation here. 2. Israel has and still does commit crimes against humanity, review there record of how they treat people as if they are not Israel and let me know what conclusion you come to. 4. Being anti Israel does not make one antisemitic, the same you being Jewish and seeing this conflict from a Jewish standpoint does not necessarily make you inherently racist although some of the commenters above are racist. She sees a conflict from her standpoint where her people have been killed by the thousands. At the same time ywn is outraged by the death of a Israeli women at the hands of a terrorist. She can be outraged by the death of two teenagers protesting on the border. 5. Claiming aipac has more say cause of money isn’t anti-Semitic and is actually factually true. The reason nra has power is the same. And the reason all the Democratic leaders including Schumer spoke up is cause there afraid to lost there money from Jewish big money supporters. 6. The reason most politicians see the conflict from Israel viewpoint is money, why are you all so afraid of them hearing it from another viewpoint. 7. If someone would say let all the Jews go back to where they came from etc. Back on the boats. Etc. Would that be racist? Anti-Semitic? Why out of all the people in the world do frum yidden think they should express themselves this way?!. 8. Some empathy wouldn’t hurt anyone. Do you think most Arabs want to kill Jews do you think most palistainian laymen want anything but peace?. jackk, the problem is that Ilhan Omar and her family brought their “failed state” to America with them. Rabbiofberlin, what an insult, demeaning, and insensitive comment from you! How about millions of Jews might have been saved if Democrat FDR wasn’t in the White House. Millions of Jews wouldn’t be killed if antisemites simply didn’t hate us for who we are and the way we were born. Shame on you! RabbiofBerlin. We are not against immigrants, we are against illegal immigrants. Do you really not understand the distinction? To Berlinerrebbe…..Moishelah has already advised us that his Ancestry.com DNA tests prove conclusively that he can trace his lineage to several regions of the Alte Heim where no intelligent yiddeshe life was known to exist. He can be relied upon to provide entertainig commentary devoid of facts but replete with the racist tropes that we have come to expect from the Trumpkopfs. TGISHABBos-your comments are totally irrelevant. The doors of the US were shut to our people in that awful time-and we perished in the millions- I don’t want to have on my conscience that same fate of other people. you may not care but I do. moisheingolus- you are truly in golus . and the sad part is that your remarks about sharia law and the like is exactly what the anti-Semites said about our parents and grandparents not o long ago-and we lost six million jews! Gadolhadorah, do yourself a service: next time you start typing please take your medications so we can make sense out of your drivel. rabbiofberlin- and who was the president at the time? Say it!!! Democrat President FDR. “same fate of other people”- Apples to Oranges. I really don’t think what the Jews endured in Nazi Germany can be compared to illegal immigration from Latin America of today. Please recall that Mexico offered residency to the caravan (the caravan refused), no such offers for Jews in the 1940s. “sharia law”- I don’t believe I mentioned anything about Sharia law in my above postings, but I will respond. Our Torah is NOTHING like Sharia Law and the Quran. Sharia law explicitly dictates rules and regulations for everyday Muslim life. Nazis didn’t hate us because of our halachos written in the Torah, but simply because we were Jews. I can’t even believe it’s an argument with you. MoisheInGolus, no amount of medicine in the world with help GadolHadorah. I quit bothering with her. She’ll forever call President Trump “Trumpkoph”, but we see no derogatory nicknames for many nasty Democratic politicians of late. She will always first and foremost be a liberal Democrat, followed secondly by a Jew. TGIShabbos- I responded to your slightly more moderate comments on the other thread. No one is comparing the Nazi atrocities and the Holocaust to immigration from Mexico. But the Somalis fled a country that was rife with violence and killing, the Cambodians endured a brutal dictatorship that killed tow million Cambodians and many other people fled to the US because of death and violence. My point is that we, as Jews suffered grievously from the xenophobic currents that pervaded the US un the late thirties and forties- and millions of Jews perishes because they had nowhere to go. So, for us Jews, to deny shelter to other people who are fleeing death is wrong, plain wrong.